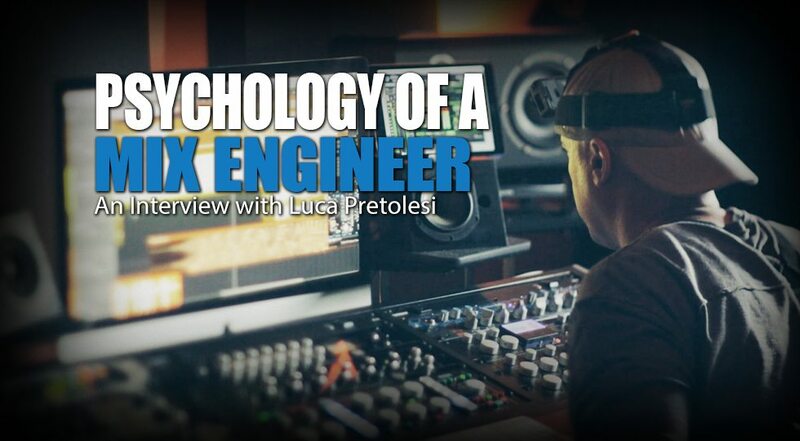 Luca Pretolesi is an Italian born mixing and mastering engineer currently working out of Studio DMI based in Las Vegas, NV. He has received two Grammy nominations for his work on Snoop Lion’s “Reincarnated” album and Steve Aoki’s “Wonderland” album. His increasing notoriety is in big part to the number of high-profile DJs and producers who have sought out his talents. 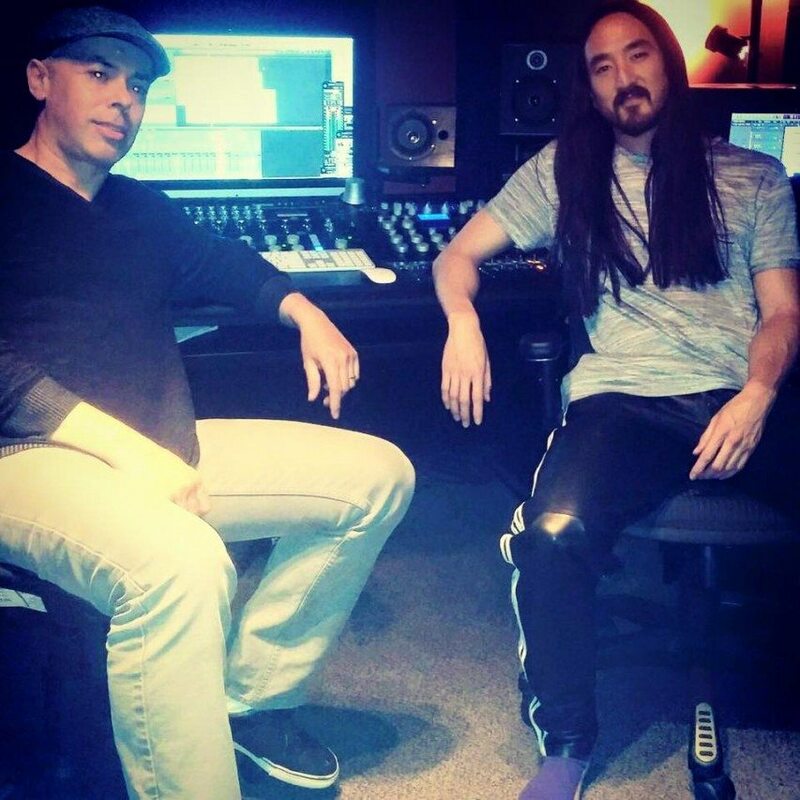 After mixing a track for an artist on Dim Mak Records, Steve Aoki picked up on the polished delivery of the track. Pleased with the results, he then bestowed the task of mixing his entire album ‘Wonderland’ – a project that lead to a Grammy nod under the category of “Dance Album of The Year” for Luca and opened the door to work from the biggest names in EDM. Within the last year alone, Luca counts Diplo (along with side projects Major Lazer and Jack U), MakJ, Lil Jon, Savoy, Gareth Emery (who’s “Drive” album reached #1 on iTunes Dance charts), and Snoop Lion (Grammy nominated under “Reagge Album of The Year for “Reincarnated”) among his most loyal clients. He has also been chosen to complete the work of artists such as Iggy Azalea, Morgan Page, 2 Chainz, and Calvin Harris just to name a few. 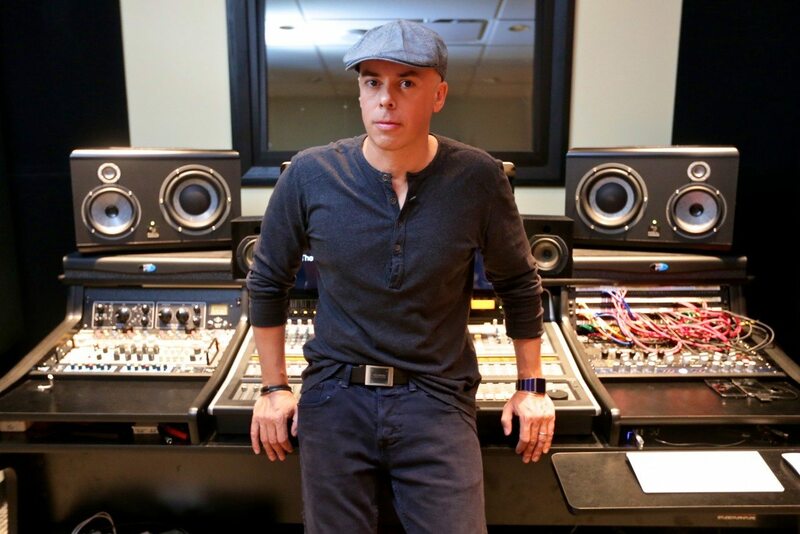 With the opening of The Studio at the Wynn/Encore in July 2013, Luca and his skills are now even more accessible to resident Las Vegas DJs and those on tour. I started the typical way. First off, I’m Italian and I was originally born in Genova but then moved to Milano when I was 16 years old. I went to an audio/recording school at that time so I was very young. In fact I was the youngest in my class. I did 3 years at the school in Milano. There I did my formal mixing and recording education. I thought the information was great but since I was young, I never thought I would use it. So as soon as I finished school I started producing and this was the late 80’s so just imagine low cost and very simple gear. I was a hybrid compared to my other colleagues at the time. There was my formal education side where I knew how to record instruments, I was a keyboard player, and I was also a DJ so I fused a hybrid approach of how to create music. So I started as a producer but I took good care of the mixing as well. And at that the information we have now was impossible to get so I had to do everything by feel. What happened was the first few good dance records I put out, my friends noticed and said “Wow, your music sounds really good. It sounds like a record“. So that’s when I started producing and mixing for other people. At one point, when I had the luxury to focus on just one aspect of music, I chose mixing and mastering because that’s what was in my heart. Actually mastering came a bit after. I went from being full analog in the late 80 to early 90’s to jumping into the digital plugin world very quickly. I was able to use the best of both worlds in a very unique way verses my colleagues or competitors. There were the old school guys who would only mix on analog and then the new generation on the early digital systems who would only use plugins. I was willing to be open-minded and use both and to this day I still utilize both worlds. You mentioned your roots being in EDM as a DJ/Producer. Now I know EDM is one of the few genres where almost every producer will mix their own records so how were you able to break down that wall and get those gigs? Honestly, if you were to ask me to mention another mixer who is doing what I am doing in the EDM world, I don’t think I could even think of one. Really everything started very organically and with trust. There were a couple of records I mixed where my part made a pretty big impact on the final outcome and the integrity of the sound that it became important for those producers to want me and to have me on their next records. So the question becomes, how do they give you the chance to actually touch the first record? That’s probably my Italian background and I’ll tell you what I mean. There was a moment in the early to mid 2000’s where there was a new push of Electro House from Italy. A lot of these artists came from my circle of friends and they all exploded in a matter of like 5 years and they were all from Italy. I was involved with them on the mixing side and not because they needed a “mixer” involved but because I could really help on the records in general. I put my hands on a couple of those records and they went really well. So well that when America caught wind of what was happening in Italy they had an open mind to the fact that there was a combination of elements that made those records sound the way they did. Also at that time, I was one of the few people who was able to mix really loud records and that came at a point when Beat Port was transitioning from traditional house music to the more aggressive sound we were creating. So I was able to mix those records really loud but still retain all the dynamics. One record that I mixed was for a group called Peace Treaty from Steve Aoki’s label Dim Mak. They heard a record that I worked on and they really liked it and they wanted a similar sound. Steve Aoki asked Peace Treaty who mixed their record because none of his records on his label sounded like that at the time. From that point it was really just a snowball. One thing that really helped my career was when EDM took that step up and producers started to come in with a budget. They would be on the road a lot, they didn’t have the luxury to be in the studio for weeks mixing a record, and they didn’t mix for a living so they just wanted to get it to sound as good as possible. Since they were now signed to a label, they had a budget where they could pay a mix engineer to mix their record. Since I was in the right place, at the right time and I had the skills to help them, they just came to work with me. You know DJ fees went from $2000 to like $25,000 in a short period of time so a lot of them were willing to pay to get the best possible sound that they could. Also, another thing that made me unique was the fact that I had a DJing background. 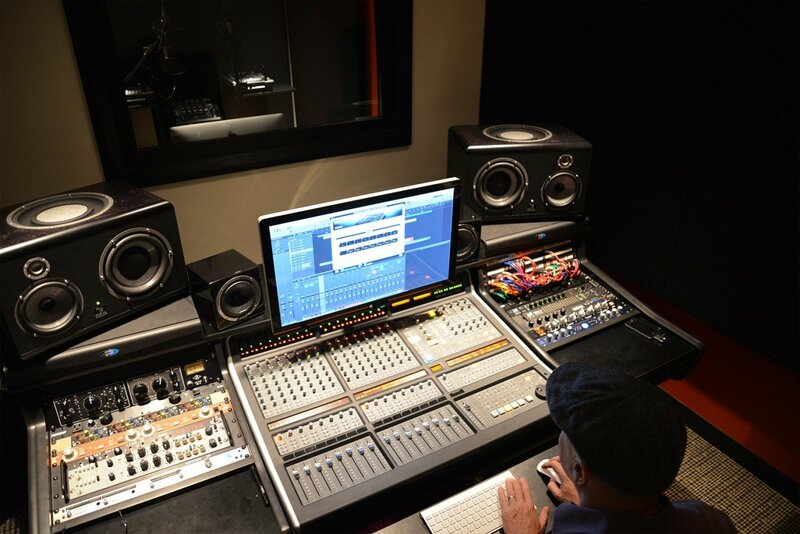 Most other mix engineers came from a background of playing drums, guitar or another instrument. So when I talk to other DJ’s we really connect and we talk the same language. You mentioned how there was a time when the budgets weren’t quite there but you really loved the mixing and mastering side. So how long did you have to do mixes for free or next to nothing before you started to see the money come in? In my case, I was doing a lot of things in the production world that were making good money so the mixing really was an extra thing thrown in. So basically I was producing in Italy on a bunch of projects that did really well and made it to the charts. And as I was doing my production work, I was throwing in the mixing as a bonus and people where like “Wow, Luca’s productions sound so good” that there was no need for a mixer. So that’s what I started to do, was to bring my mixing skills as part of my contribution on the production side. When I started to make the transition to only doing mixing and mastering, it was very organic how it all happened. I think in my case, yes, there were some times where I would help friends do a mix for free but when I mixed a couple of hits in my circle that really made everything legitimate. So now people would associate me with mixing EDM dance records. Because there was no money in dance music, it was hard for other mixers to really dive into our scene and make a living off of it. So in my case, it was natural and thank God that the scene exploded [Laughs]. And once things did step up to that next level, I was ready and I knew where to place myself. I was able to get set up as a business. We now have 3 studios, a couple of assistant engineers, and a management side so I was (in some way) able to deal with record labels. I could just focus on what I do best which is mixing and mastering and have the rest of the team deal with the other stuff. Okay, so let me expand on my question a bit. 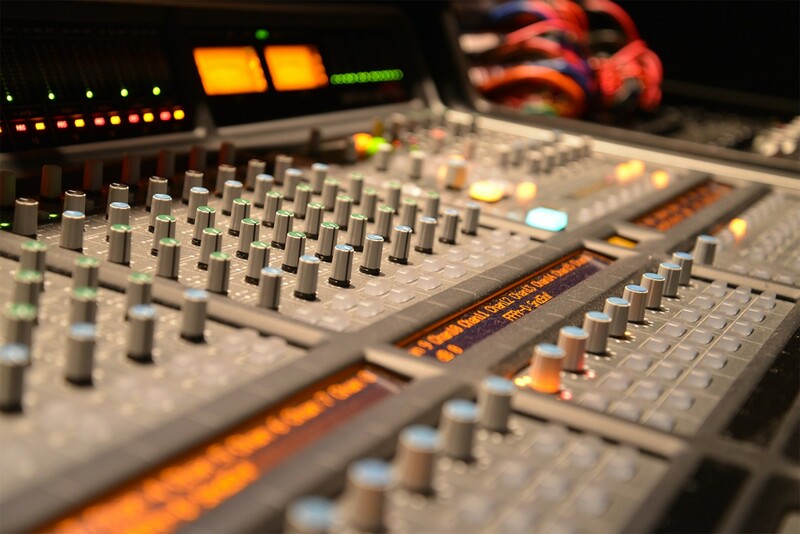 Since mixing tools are so accessible these days, almost anyone can become a “mix engineer”. So for someone who wants to make this as a career, what would you tell them to do in terms of building their skills, building their credentials and potentially taking on gigs for free? At some point it’s a supply and demand thing. So when you start, it’s out of the question that you should try to charge for your work. At least not until you provide that first mix and they absolutely need to have the follow up record mixed by you. You need to create something where you are invaluable to that producer. I felt what happened with me was that I created a standard as a producer that I needed my next record to sound as good or even better than the previous one. When your contribution as a mixer becomes more on the creative side and not just the technical then your contribution becomes part of the production. At that point it’s essential to have you on board for the next record. When I say creative mixing, I mean bring a tone or quality to the mix that to me is additional production work. There are certain records that if you were to turn off the plugins you would lose some of the body and the emotion/soul. So I think the mixer who can maintain the integrity of the song but also to add an element that brings out the emotion in the song, will have a chance at this career. I think watching tutorials and learning how to use equipment is great for your knowledge but at some point there is something personal that you have to add to the mix. There’s something that’s part of our ideas that makes us unique. Like you said, it is getting difficult now because we’re all using the same tools pretty much. I mean I have some analog gear that costs a bit more money but the essential plugins we all have access to. With the plugins we risk getting too comfortable and conservative because we have access to presets. You could load up a preset called “1176 kick” and it might sound right and then you just stop because you feel like you have “the sound”. One thing I tried to do in the early stages was to push more because I didn’t have the luxury to have the tools we have now. To be able to use a couple pieces of gear and then pull the best out of that gear that I could, that was something that helped me be able to approach mixing today. I always like to push a little bit more. Actually now that you mentioned the presets, let’s talk about that a bit more. On one hand the presets are great because, like you said, it let’s you dial in things fast but at the same time by using presets it takes away the learning and exploration of that particular plugin. What do you think? Totally, I find that with producers that I know, who are actually really great producers but not really mix engineers. They don’t know that the 1176 attack and release settings are actually opposite of every other compressor. It’s shocking. It’s like buying a car and putting it on autopilot. And what you do with your website, it’s very important because you give information. And it’s ironic because when I was starting out there was no Internet and very little information. So we came from having almost no information to a time where there are endless amounts of information – it’s all there. Yeah, like information overload. Would you say that at some point, you need to get past the information and just sit down and mix? At least I found I always learned more by just mixing then I did from trying to gather as much information as I could. Yeah, that’s very true. If you think about the approach of playing a guitar, you might have a distortion pedal and you go crazy trying to get your own sound. You don’t just push a button and expect the guitar to scream and start talking to you. It’s very similar to mixing. Even my clients are mixers to some extent but what makes me a bit unique is that I put in all my time – 100% of it – into mixing records. People say “I can mix my own records” but the difference is that the number of records they mix is equal to the number of records they produce. If you do ten songs a year then that means you mix ten songs a year. That’s equal to how many songs I would mix in a week or two – I mix about a song a day. This means that I’m exposed to the issues and problems that a producer might be facing everyday so I’m able to speed up the process. It doesn’t mean that I go into autopilot mode and that I don’t do anything. It means that I have the luxury to just mix and that I can specialize in what I do. It’s almost like I can fix my car myself and that might work or I could go to a specialist who does it every day. So you had a great point about exploring and going deeper and it’s ironic because even though I’m mixing a record every day, I still find the time after work to just try new techniques. So someone who’s only mixing 10 songs a year has a lot more time to explore new techniques and do new things but they don’t have the passion to do that. Since we’re living in such a digital world, I wanted to know what your approach is when working with artists. Is everything done online and through video chat or do they actually come to your studio to collaborate? Right, Steve [Aoki] actually moved to Vegas so he does come to the studio. When I mixed the first album for him, it was mostly through email. I was kind of working as the hub to get his production and also vocal tracks from different singers. He was always on the road so the communication was basically always online. On the new album that we just finished, Steve would just spend the day with me after the mixing process to chill and feel the song and give me feedback. So with him it was more of a personal thing and it was cool to have him in the studio. Skrillex, whose a friend, really likes another studio that we have in Vegas and he uses it as a production and writing room. We have more of an organic relationship and I understand what he’s going for, what his limits are and in that case we do spend time together. I don’t mix a lot of songs for Skrillex, he has a very unique approach. He’s very natural, he has amazing ears, he’s a great producer and actually a great mixer because his mixing is coming from sound design. His mixing is actually a very small part of his sound, it’s mostly sound design and arranging. But when I did mix records for Skrillex it was records he did for Jack ü, which is a collaboration with Diplo. I mixed a lot of records for Diplo, Major Lazer and Mad Decent. Diplo brings me a lot of work, all kinds of different things he’s involved in. So I’m involved with him on a different level. I noticed that you use Focal’s as part of your mixing setup and was wondering what made you go with those over another brand? I was on Genelec’s for about 15 years. I used any type of Genelecs and I was comfortable with them. Then 3 years ago we opened the studio inside the Wynn Hotel/Casino. We had a small room but I just wasn’t happy with the Genelecs. I wanted something with a tight low end and I didn’t want to have a sub on the floor but I still wanted to feel like I wasn’t missing anything. What I did was try to find everything that was available from $5,000-$10,000. I wanted to find a speaker that was very transparent and I didn’t want something that sounded totally new that I had to learn all over again. So I basically wanted something similar to the Genelecs but just translated better in the low end. I tried the Focals [SM9’s] against 5 or 6 other speakers and I felt much better with them. What I found was it took about 2 weeks to really get comfortable, there was no phase issues on the low end and the sweet spot was actually bigger then other speakers. I also felt the Focals were able to adapt to a room that wasn’t treated well. The best thing though that I found was ear fatigue. I could mix on the Focals for 9 hours or more and I would be totally fine. Great Speakers! 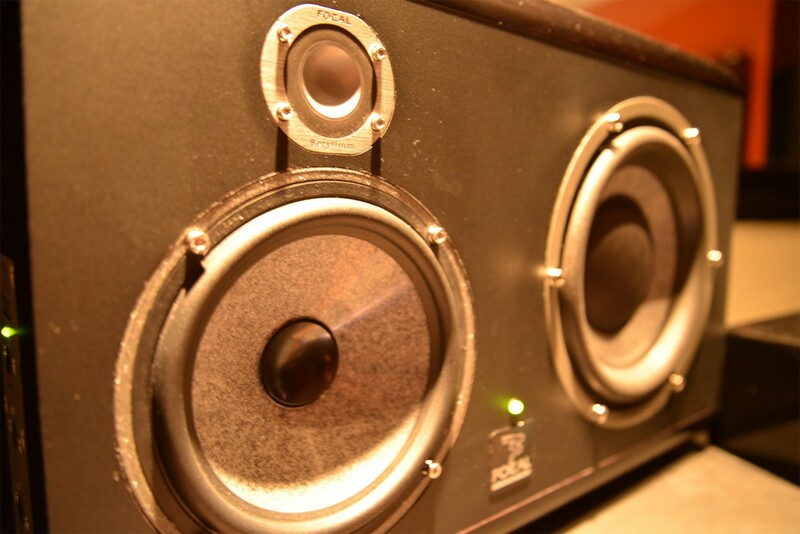 And what are the two smaller speakers on your mixing desk? 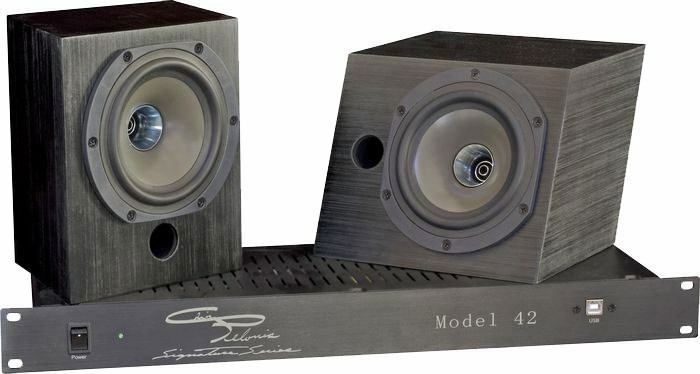 Oh those are the Pelonis (Model 42) speakers. They kind of have technology taken from the Tannoy speakers so you have the tweeter inside. They’re sort of like an HD version of the Avatones to me. So you have that kind of sound but you have incredible mid frequency response. They’re passive and they have an amp that has a USB input so that you can do some simple calibrations. I love them. I feel like they cover the gap between the Focals and the Avatones. I have the Avatones in the other studio but I felt like it was cutting too much. It cuts somewhere in the 100Hz frequency and below. It’s like c’mon. The Pelonis cut down around 65-70Hz but they have a really good frequency range. I use them a lot when I’m mixing vocals, when I do low level reverbs and delays, and when I do a final mix for radio. I don’t use them for drums but maybe when I’m 80% through the mix I will start to move between the Focals and the Pelonis. So for the first 80% of the mix, you are on the Focals? Yeah, I want to get excited and I want to feel good. There are a lot of psychological things about mixing and I find other colleagues have a very similar approach. I don’t prep any of my mixes because I don’t want to listen to the full song. The reason is because I don’t want to get married to the way it sounds. I’ll create markers and then jump to the different parts of the song. That’s why I like to use the Focals because at this point, I’m just a listener and I want to get excited. Because I’m also a mixer, I’m exposed to things right away that I don’t like. So if I listen to the track too much then I’ll forget the things that I don’t like. Right away I’ll start fixing things that I don’t like really quick. In about 15 mins, I’ll do probably 50% of the mix because I do the main parts. The rest of the 7-8 hours is focused on the minor details. Besides getting the basic volume levels, the first thing that I try to do right away is approach the stereo bus. So if the track is a little bit too dark, I will make it brighter. I’m not going to fix each individual channel and add like 10k on each part – I will just do it once on the stereo bus. I’ll do that in the analog domain even before I touch any plugins. I’ll also do my stereo bus compression before I start mixing the song because I want to mix into the compression so the track is breathing a certain way. It forces me to make certain decisions based on what the compressor is giving me back. 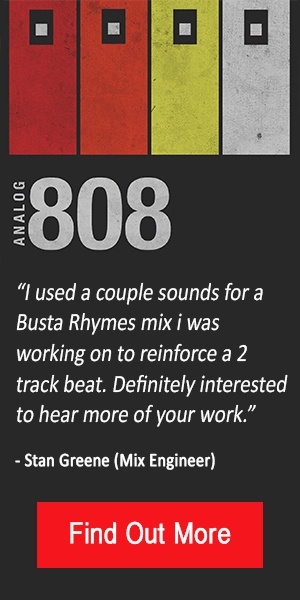 So you don’t listen to the rough mix at all? I do. I have a nice mastering console and it has a good monitoring system. I’m able to always go from the dry, rough, reference to the mix and mastered version. So I can play it, match the level and always go back to check the rough. When I listen to the first mix, it’s always equal to the rough. So when I listen to some parts, it actually is the rough. I always go back to the rough to check myself. I want to make sure that I’m taking the track in the direction that I want but at the same time I want to try to conserve the vision of the production. Sometimes I will call the producer and ask them if they are married to certain parts of the mix. If they say yes, then fine but if they say no then I do my own version of that. So I’ll listen to the original wet version then go back to the dry version and try to repaint the picture. Are you using Pro Tools because I know most EDM guys don’t use it? Nope, I don’t use Pro Tools. I use Logic X Pro and I’ve used Logic for many years. We have Pro Tools as well and we usually use it for when the non-EDM guys send us Pro Tools sessions. Part of the prep work is to transfer the session from Pro Tools to Logic and then I mix in Logic. And what if there is processing or effects (via plugins) on those Pro Tools sessions? We bounce that. And I actually did that recently on a Snoop vocal. There was some special phaser effect and we bounced it that way to keep it. Also with the Pro Tools guys, the more traditional ones, I see these crazy sessions with 250 tracks. It’s not necessary and at the same time it makes the mix become much more technical at that point. You’re over analyzing things that take away from the soul of the song. What I’ll do in these cases is quick grouping mixing by bussing the parts and then I’ll make a decision and commit to it. I always like to use the example of the first Beatles record. It was a big deal because they had four tracks (mono) so the audio engineer had to make commitments that stuck for life. We went from that – making records that changed the history of music – to today where we have 250 tracks, really? There has to be some common ground I think. So let’s get into automation. If you aren’t automating in EDM, then you just aren’t an EDM producer, right? I’m assuming that as an EDM mixer you are probably super charging that. So what are some of the automation techniques that you are using right now and if you aren’t mixing EDM style music, how can you apply those techniques to other genres? In EDM most people think of automation are filtering, delays and other things like that but for me it’s mostly dynamics and saturation. In EDM we usually have blocks like our 8 bar build up or a 16-32 bar drop. So what I like to do with automation, to add dimension to the mix, is work with parallel automation. If I have a snare roll for example, I’ll build it up. It’s a static 909 snare that’s doing nothing more then going from -40dB to -10dB so I’ll add automation for saturation or even open up the stereo field. The saturation is in parallel and it will build up with the build up and then close at the end. You shouldn’t be able to pin point the automation moves but you will be able to feel it. I use a lot of automation for that purpose. I sometimes like to play with mixing from mono to stereo on my mix groups. Usually I have a very specific way I like to mix so everything is divided into groups or busses. Each bus is going out through the SSL so I’ll create my 8 busses that way. I’ll have my low synth and my high synth, which overlap a lot, so I try to create separation between the two. For example, I’ll use automation on the low synths that are dense and make them mono and I’ll take the high synths (stabs and leads) and make them very open. I’ll work the contrast of these two spaces. Awesome. Also kick drums are super important to EDM records especially since they tend to be very dense. So how do you get the kick drums to poke through these dense records? One of my most popular mixes was ‘Turn Down For What’ by Lil Jon. That one had a total of like 12 tracks. Done! It was very simple. For me it was almost like working on stem mastering. It was literally 12 tracks and they were very rarely overlapping. So when one element comes in another goes out. With that track, the kick drum has the personality that we are talking about. To be able to translate on radio, the club and everywhere it’s crazy. The kick is pretty much covering the entire bar and the track is 100 bpm. So the kick drum tells it’s own story. If you look at my desk, I have an entire rack that’s dedicated to just kick drum processing. I have some vintage preamps, a vintage EQ, and some parallel compression (UBK Fatso). So I have an entire process for the kick(s) because in EDM we use a lot of multiple kicks. I’ll also do a lot of side chain between the kick and bass. It’s the one element that if it’s not right, it’s going to destroy the entire mix, so it has to be right. The kick is also about the relationship to the bass as well as the relationship to other low percussion. One thing that I do which is different then other genres is work stuff around that kick. So if I have a dance mix with a lot of low end I’ll make sure the kick is the leader and everything else just works around it. I’ll use a side chain with multiband compression on certain frequencies because I want to make sure that when the kick hits certain notes and the bass is in conflict with the kick, I’ll fix the bass, not the kick. Everything has to work around the kick. So will you start with the kick or just focus on it heavily? I focus heavily on the kick. When I do my first initial mix, I make sure my kick level is there compared to my other sounds. When I’m happy with the level of my kick then I start to make the kick right. Rarely will I go to my gear and try things, I’ll usually determine what I need like I may want my kick to sound rounded, maybe I want more transient or I want the tail to release a certain way. I literally figure out how I want the kick to sound in my head and then I just make it happen. From there everything needs to sit around it the proper way. One thing that I see is that there is a perception to make everything wide because it’s better but it’s not. People often say, “Wow your mixes sound super wide” and it’s because I choose the elements that I want to sound wide. It’s the contrast between what’s super wide and what’s in the center that makes things sound wide. Some rough mixes that I get, I check them in mono and everything collapses. So what I do is turn everything into mono that’s around 300Hz and below because there is going to be a lot of phase issues, plus the level of compression that we are using and some kicks have long tails. I don’t want to have anything crazy in the 100-300 Hz range that’s going to put a cloud on my kick drum. So what are you doing to make things 300Hz and below mono? 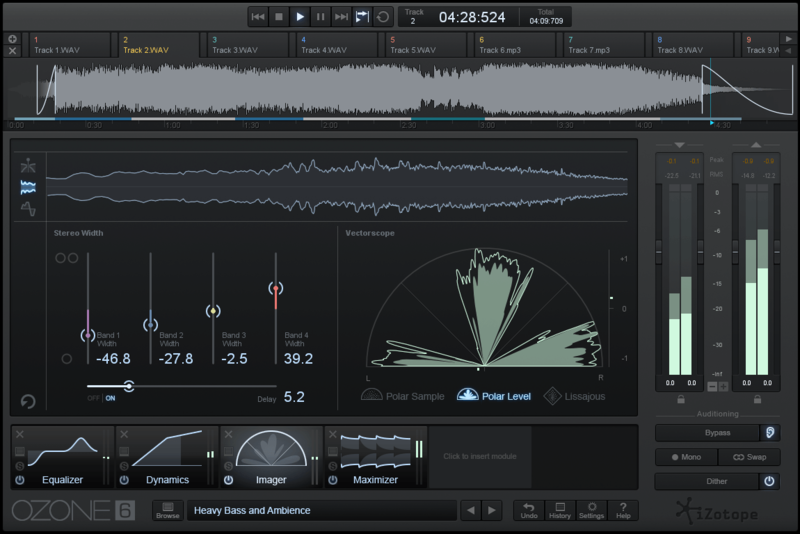 Right now I’m using the Izotope Imager, which is part of Ozone 5/6. It’s a multiband so you’re able to take apart the frequency spectrum and make it completely mono. So I use that. So you take the last band in Ozone 6 set it up to approximately 250Hz and bring it completely down to 0? Correct. 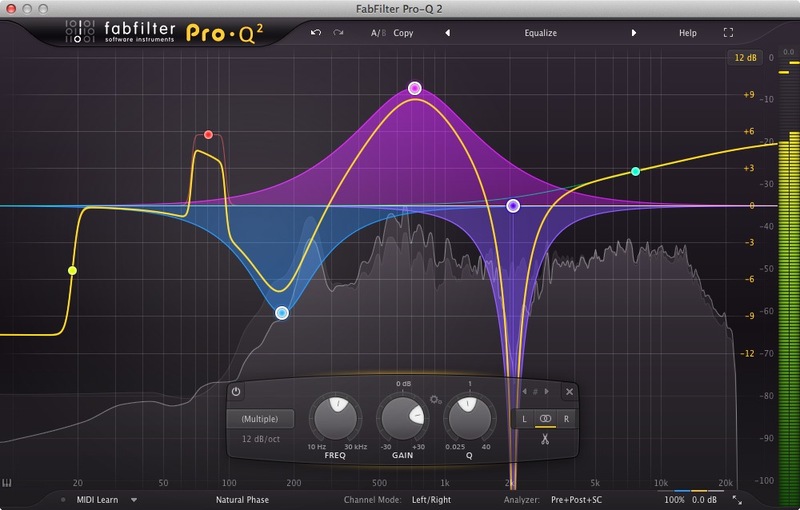 And there is another one I use a lot – the Fabfilter ProQ 2. With that you can split the bands and make a low cut on only the sides or only the mids. 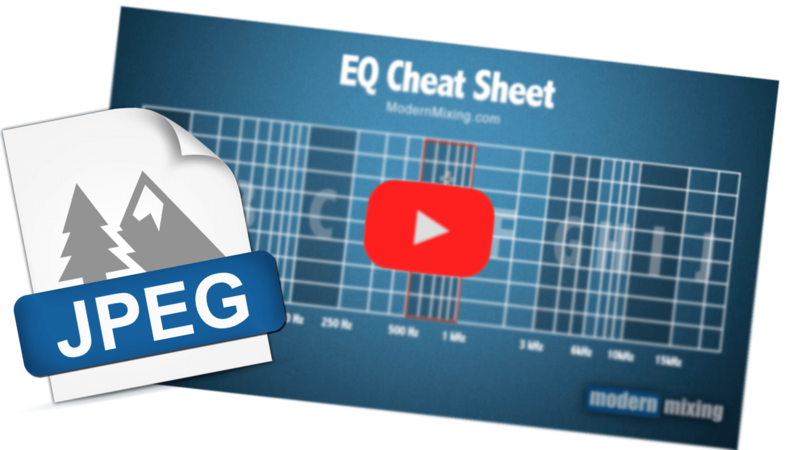 So what I do with something that is very dense, with a lot of reverbs and delays, is use a side EQ and engage a low cut between the 200-300Hz range to get rid of that side information. And the center remains as is? Absolutely. Sometimes I even push the side up if I need to compensate. The reason is because when you get rid of side information you sometimes lose a bit of energy. I might even do a little bit of compression just to bring up some of that low level information up. Great, if you don’t mind just going over your current set up. What tools or gear are you using? Sure. The studio is set up on a mastering console so the desk is a mastering desk. The reason why I wanted to work on a mastering desk is because of the sweet spot. I want everything to be in front of me. The old school studio in the 80’s when you needed to make a tweak to the kick drum and had to reach behind you, it’s just ridiculous. Everything is based on Logic Pro (the brain). I use an SSL Sigma as a summing device not because of some special “sound” but because I need to integrate a bunch of hardware as inserts. I don’t want to have to go A/D and D/A constantly on my convertors so I use the Sigma for that. The Sigma is also cool because it fully integrates into Logic so I can ride my automation in the analog domain and when I load my session it reloads all my automation. I have a combination of convertors that I use for different tones. So I have the Lynx Aurora 16 that for me is my Drum D/A but I usually only use 8 channels. It’s very aggressive but it’s not the best for stereo information and detail but it’s great for drums. I have two Metric Halo Lio’s (32 channels total) that I use for synths, vocals, effects – all the pretty stuff. On my stereo bus is the Maselec MTC-1 mastering console. It sounds incredible, is transparent and has a lot of headroom. I use this on the first stage of the mix as a stereo bus. I don’t do any extra inserts as far as mastering. I do just two, my compression and EQ. Then I have a rack here with some vintage gear. Everything is captured to another computer. I don’t use the same computer to capture my mixes. So when you print your mixes, it goes into another computer? So once the sound leaves your system, it never goes back into it? So how come you do that? Upsampling. I want to capture 96kHz. Some people might ask why you would want to capture 96kHz and it’s because I’m clipping my convertors. I use the Prism Lyra convertor as my A/D for capturing my mixes. It’s the only one (and I’ve tried many) that I’m able to clip in a very musical way using 96kHz vs 44.1kHz and it handles the clipping much better. I can push an extra dB or two. Because I use another computer and because I capture 96kHz, I monitor post conversion so my final monitoring is with digital clipping. If I want a few extra plugins, I’ll put it on my second computer and that’s my final sound. The two computers are connected so if at any time I want to transfer a file I can just move it. Wow, that sounds like a lot to me. What happens when someone decides two months later that they want the vocal bumped up 0.5 dBs? We are a machine! If you talk to Manny Marroquin and other engineers, they will tell you the same thing. We take photos of the gear and we print stems if we need to. When I say stems, I mean the main stems. So Instrumental, Accapella, you know, the main elements. So if they want a dB on the vocal then okay fine, we don’t have to recall the whole thing. But as far as the desk, we literally have 3 photos that we take – one of each rack. Then we save a project folder and put the photos in there so that we can manually recall the gear if we have to. How long would it take to do a recall? Okay, I’m still curious about your convertor clipping that you do. I’m asking because I kind of do something similar where I have been clipping my API’s but in the Analog domain so I just want to find out more about what you do with the digital clipping. Wait, I’ll tell you more. I had the same technique in the other studio. So for a good 5 years, my technique was just that, I used the API A2D and I clipped the convertors and print it back in. Essentially it’s exactly what I’m doing right now. The only difference is that now I’m capturing it in another computer so I’m able to capture it at 96kHz. I did an A/B test with the API and the Prism and they’re very close actually but the Prism is able to handle very dense mixes with a lot of stereo information when clipping and it’s able to retain a lot more. So it’s able to bring the perceived loudness up while keeping the transients intact. If I only do drums, the API is amazing, in fact it’s probably even better then the Prism. But when I do the entire mix, I feel that the Prism is a bit better but it’s also a much more expensive unit. With the API’s, would you clip the analog side, the digital side or both? I was doing both [Laughs]. I would do a little bit of both and I would find the sweet spot. If you do too much with the mic input (analog side), you lose too much. So I would listen post conversion and then find the sweet spot right before you would hear it start to crunch. The API’s are great; it has a really nice tone. Actually before this set up I’m using now I used to have a passive summing unit (Folcrom) and I had the API, an SSL or another amp to re-amp because it was passive. API was always the winner because it was so good. So when you’re printing into your computer, it’s coming in at 0dBFS with no headroom? Yeah [Laughs]. It’s distorted. But I do two versions most of the time, especially on big commercial records that I can’t afford to reopen the mix to do a new version. I capture it the way I want it with the clipping so it’s a nice big brick but I also have a gain knob on my board that’s pre conversion and I’ll give it an extra 3dB of headroom so I will always have one version that’s clean. And when you’re clipping into the new computer, is that part of the mastering or will you go and master that file after? Yeah, that’s part of the mastering. That’s why my console has a mastering stage and when I do my mixing, my mastering is very light – I don’t do much. Once I push into clipping I will listen and determine whether I need to do any more work. I might need to take out 30Hz and below to get less clipping and distortion so that maybe I can push a little bit more into the Prism. I’ve try not using the clipping where I will use plugins to emulate get the same loudness and thickness that I get with clipping but I just can never do it. Maybe it’s just me but what I get from clipping, it’s different. So once you clip, there’s no other stage after that? That’s what you would send to the client? But I don’t really need it for loudness. Keep in mind that I’m using an analog limiter before clipping. So would you say that by clipping you get your mixes louder then you can when using digital plugins? Based on my meters, it’s the same loudness but it just sounds a little smaller and artificial. What I mean is that when I clip in analog, I retain the shape of the transient but when I start to add plugins to replicate what I’m doing, everything gets a little narrower. This is why I enjoy talking to great engineers like you because there’s so much advice that talks negatively about clipping and how bad it is but in reality it can be a very musical tool at our disposal. I think it’s important to understand what you’re doing and make sure that you’re listening to something when it’s clipping. There’s always a fine line to clipping in a musical way that gives a tone and color and going to far where you lose dimension and it all collapses. But yeah, I agree and when someone says to never clip but to try and emulate it with plugins, it’s actually worse because it’s not the same thing. As of right now, what’s your favorite ITB EQ? I think the ProQ 2 [Fabfilter] is the best for what I do right now. 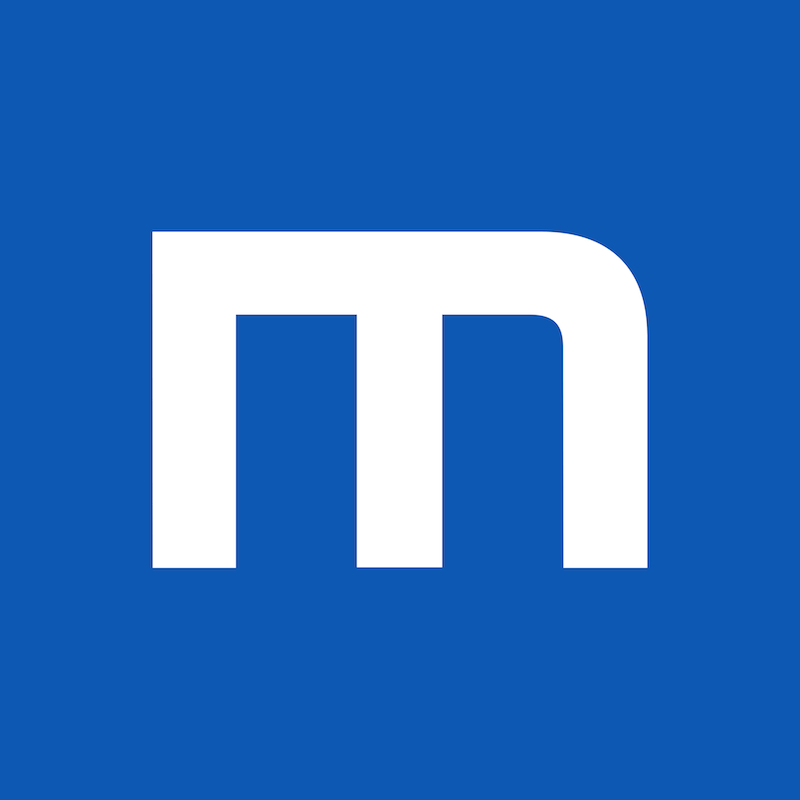 Are you using it mostly for corrective or do you use it to boost as well? Not much for boosting. I usually use it to control the Mid/Side information. It has 72dB so you can really get rid of things. Right now I’m also experimenting a lot with dynamic EQ’s, which is a bit more unique then multiband compression. The one I’m using right now is from Melda and I’ve been testing it for the last couple of months. And what are you liking as far as ITB Compression? The La2a Silver from UAD in limiter mode and the 1176 Rev A from UAD. I find I reach for those a lot. Is it the tone you like from UAD the best or is it reaction of the compressor? I like the La2a a lot on vocals and when I compare it to the analog it’s very hard to tell the difference. You honestly need to have really good cables, converters and everything else to hear the difference. They did amazing work on that plugin. For the 1176, I like to use it mostly in parallel for drum sounds and bass and I go crazy. With UAD I find that you can push a little bit more than other emulations. Is there anything you do in your mixes that you feel is unique and you haven’t heard anyone talk about? There’s probably 3 or 4 things but mostly I would say that my final stage of the way I capture my mixes (into clipping) that’s something very unique. It’s especially true in EDM as it’s hard to find people using analog gear and even more rare to find people using a creative way to clip and distort in the way that I do. Thanks so much for taking the time with me to talk about mixing and allowing me to ask you questions. I appreciate it. No problem, I enjoyed it too. Ciao!